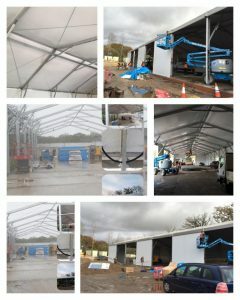 Temporary Warehouse - Built in 7 Days - Bees Marquee Hire - Wedding, Parties and Corporate Events. At Bees, We can design, deliver, install, and maintain temporary structures up to 60m in span, 8m side height, and in a variety of robust designs that make ideal and quick solutions for manufacturing or production areas, warehousing and distribution, workshops, staff facilities. Not only that, but our technical experts are instantly available, 24 hours, and we never sub-contract our work, so you always deal with Bees Marquees directly: no-one else.